Step 1 Heat the broiler or grill to medium-high heat. Step 2 Cut each chicken thigh into 8 bite-size pieces. Combine the soy sauce, mirin, ginger, sugar and sake. Add the chicken and marinate 10 minutes. Step 3Thread the chicken on skewers, then broil or grill, basting with the marinade and turning the skewers every minute so the chicken doesn't burn, until lightly browned. The chicken will take about 6 to 8 minutes to grill or about 5 minutes to broil. In Recipes-list.com we have selected the most viewed recipes from category - Appetizers Main courses . Enjoy the best recipes specially selected for you! 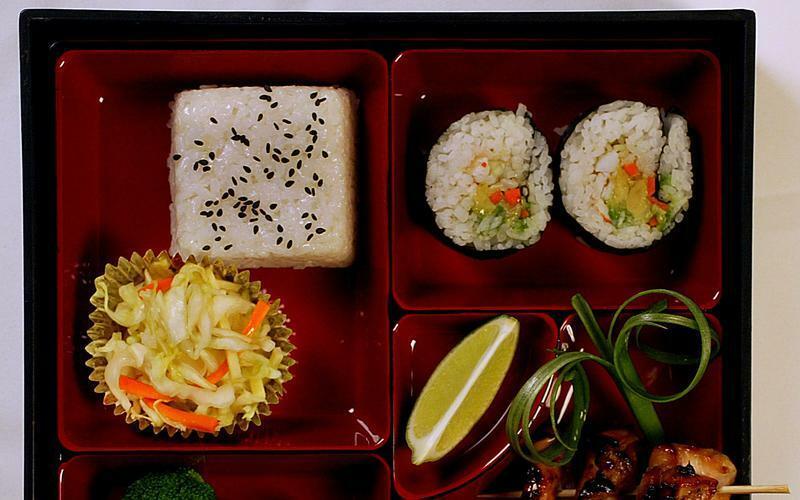 Chicken Teriyaki Bento is the right choice that will satisfy all your claims.